Confession: I read the Divergent series and the first movie and I was not impressed by either of them. I wanted to like them, but I just didn't care about the characters much and the third book was ridiculously random. 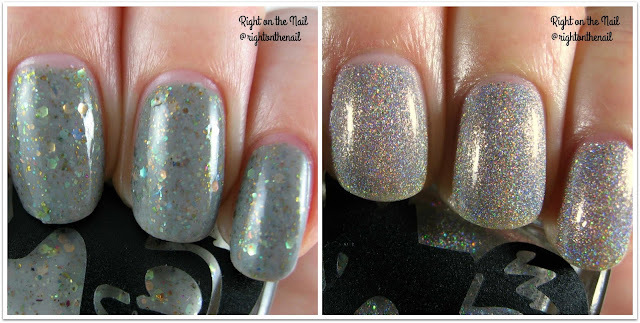 Now Dauntless the polish I can really get behind because it's a beautiful grey crelly with multi-colored flakes and iridescent glitter. I found the color to be a little bit sheer with a slightly thick formula. The Elusive Fox is a definitely elusive because this polish is randomly restocked, and you need to be on the lookout to pick it up. It's a silver linear holographic polish that can be mostly built up to full coverage in 3 heavy coats or layered over another color. If you aren't out in the sunlight very often then this will look like a plain silver color, FYI. Wouldn't it be awesome if the polish looked like this in every light? Most polishes retail for $9.50 and members of the Frenzy Foxes Facebook Fan Group do get access to special custom polishes if you are interested. As I said above, they are currently closed, but they'll be back before you know it.